General information on Pamoxan pinworms medicine. 5-7 years - 1 tablet at a time. Under 5 years old - do not take! Active component: pyrvinium pamoate 250 mg. Therapeutic effect: removes pinworms from the body. Contraindications and precautions: Store in a dry, cool place, away from small children's reach. Do not expose to heat or sunlight. If allergic symptoms occur, discontinue use. Strictly observe the age dosage. If you need re-treatment, wait 1 month after taking medicine for the first time. Is Pamoxan pinworms medicine effective? 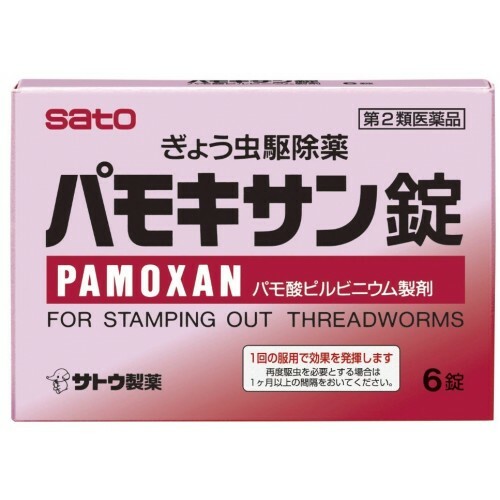 Pamoxan from Japan affects exclusively pinworms. 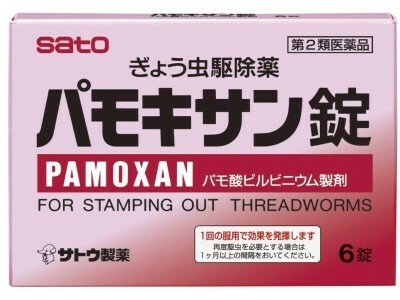 This medicine is not absorbed by GIT, which makes it reasonably safe if all the norm and prescribed age dosages are observed Please note that Pamoxan from Japan should be stored in compliance with all specified rules and regulations. In the treatment of pinworms, you must remember the rules of personal hygiene, be sure to wash their hands to prevent the transmission of parasites between family members.